Henry, Prince of Wales (1594-1612), was the eldest child of James VI of Scotland and Anne of Denmark. On the death of Queen Elizabeth I in 1603 he travelled south to London with his father, who succeeded to the English throne as James I, the first monarch of the Stuart dynasty. 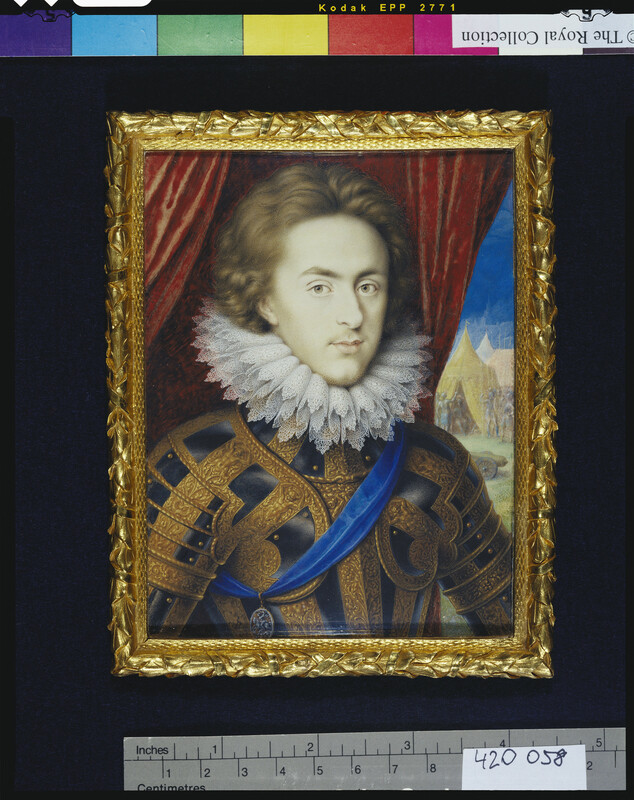 In July of the same year he was invested with the Order of the Garter; he is shown wearing the blue ribbon and badge of the Order in the majority of his portraits, including this miniature. Although Hilliard made two miniatures of Henry, Prince of Wales (both in the Royal Collection), the present example is the principal image in this medium. It is one of Oliver's outstanding works and is the basis of numerous versions. The conjunction of sitter and artist symbolises an important moment in British art. Henry, Prince of Wales, as a keen young patron, collected Netherlandish and Italian paintings and sculpture, as well as coins, medals and books. Isaac Oliver was an important catalyst in Britain's adoption of the advances made on the Continent during the Renaissance, both as regards his technique and his knowledge of European - mainly Mannerist - art. Henry, Prince of Wales, died when only 18 and his funeral was in itself a cultural spectacle. 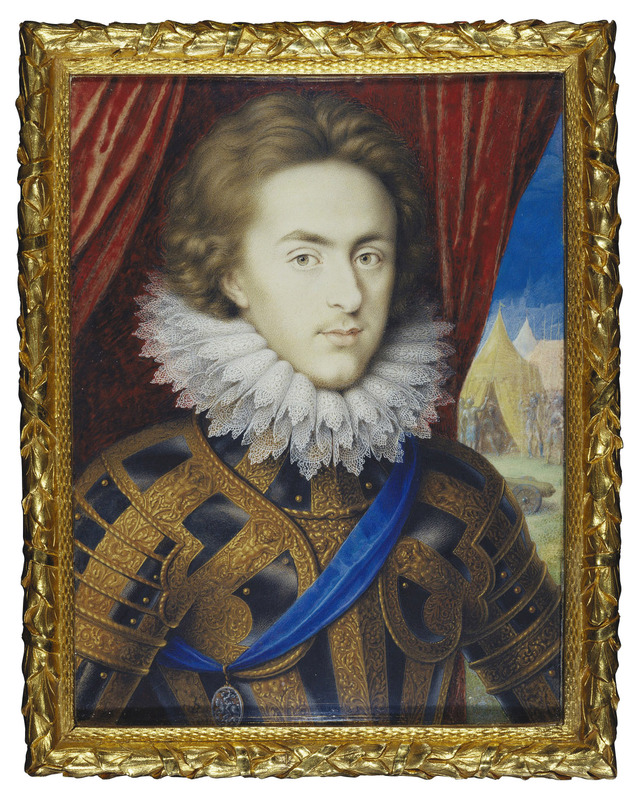 Van der Doort described the present miniature in the collection of the sitter's younger brother, Charles I, as 'the biggest lim'd Picture that was made' of Henry, Prince of Wales, and indeed in the choice of format Oliver rises to the challenge presented by the new possibilities at court. The sitter wears a suit of gilt armour (c.1570) with embossed ornament notable for its classicising motifs. Set against a curtain behind the figure on the right is a military encampment with soldiers and an artillery piece. These figures may be in medieval or even antique dress, although there is a possible connection with the more recent art of the school of Fontainebleau. The significance of this miniature becomes apparent when it is appreciated that Prince Henry himself took part in tournaments and masques. One such example was the Barriers devised by Ben Jonson and designed by Inigo Jones. This was performed on Twelfth Night 1610, in the Banqueting House at Whitehall, and was set in the time of King Arthur.